Raymond Sellars (Michael Keaton) is the CEO of Omnicorp. They make drones used for public protection. Sellars, anxious to cash in on the US market, hopes to introduce his drones as the new police force for the country. However, Senator Hubert Dreyfuss’ (Zach Grenier) bill to prevent the introduction of the robot force to the streets of the United States has garnered a lot of support, threatening Sellars’ billions of dollars in revenue. Alex Murphy (Joel Kinnaman) and his partner, Jack Lewis (Michael K. Williams) have bypassed protocol and are looking to bring notorious gun dealer Antoine Vallon (Patrick Garrow) to justice. After a failed arrest attempt by Murphy and Lewis, which resulted in Lewis being hospitalized, Vallon decides to take care of Murphy. Murphy is nearly killed in front of his wife, Clara (Abbie Cornish), and son, David (John Paul Ruttan). He is left clinging for life. Clara, desperate to keep him alive, agrees to let Sellars, and his robotic prosthetics expert, Dr. Dennett Norton (Gary Oldman) put what is left of Murphy (which is very little…) into one of their drones. This takes advantage of a loophole in Dreyfuss’ bill prohibiting the robot police force, allowing Sellars to have a marketing piece to sell his droids to the public. Murphy, with the “help” of Dr. Norton’s tweaking of the system, becomes a super cop. He is faster and smarter than any cop, or criminal, on the streets. As soon as the Detroit police department’s criminal database and security systems are uploaded to Murphy’s computer-enhanced brain, he begins making arrests. When Murphy uncovers some corruption and begins attempting to solve his own attempted murder, Sellars realizes that things may be beyond his control. 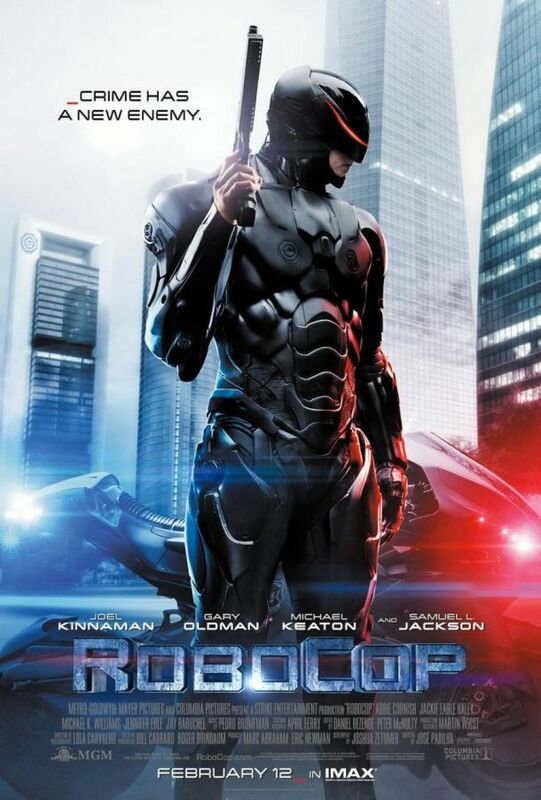 I’m not sure exactly how I feel about a remake of the 1987 Robocop. I haven’t seen the original in probably 20 years, though, I now have a desire to watch it again. I fear that it probably doesn’t hold up over time. It is most likely one of those untouchable movies that is put on a pedestal simply because you grew up with it. Either way, I don’t know that a remake was needed. If you ignore that it is a sleeker looking remake, the new Robocop isn’t a bad action movie. There is plenty of high-tech action, pitting man against machine, and machine against machine. It highlights where we are, currently and where we are very easily headed, technologically speaking. There is also plenty of social commentary, thrown in for fun. The tone of the film, especially with its subtle nods to the original, has a similar feel to what I remember of the original Robocop. That is, it has a very campy, 1980s feel to it. From the cinematography, to the action, to the acting. I was, however, slightly put off by how fast and agile Murphy was, unlike his slow, calculated moves in the 1987 film. They throw in a few of his signature “turn the upper body, then turn the legs to match” moments, to appease us older folks. But it just wasn’t the same. Again, if you ignore that this is a remake of a classic, or you haven’t seen the original, the new Robocop isn’t a bad movie. Plenty of action, enough story to keep the movie going at a decent pace. I just have one question: Why did they keep the hand? It doesn’t make sense in this version.